"Save the rebellion! Save the dream!" It took a long time for me to admit to myself that I was never going to be able to judge a Star Wars film with a completely clear, critical mind. At a time when nostalgia is thriving because so many people want that warm and welcoming blanket wrapped around them, there are few things that take me back to my childhood in a way that is so fresh and vivid that it almost feels like 25 years ago could have been yesterday. Star Wars is one of them. Now, I am not going to wax poetic in somber tones and ask that you hear sympathetic violins over my words as if I had a rough upbringing. I didn't. I have lived a blessed life from the moment I was born, but like anyone there were good and bad moments sprinkled throughout the adolescent years that shaped me into the person I am today. No matter what was happening, no matter how seemingly dark it got, I could count on the VHS tapes of my favorite trilogy waiting for me anytime I needed them. Some will roll their eyes at people like me and say it's just a movie, and in a sense they are right, but it's not that simple. The memories of my life are soaked in the frames of the original trilogy, and I will be seeing them play over those iconic cinematic images for as long as I am lucky enough to be able to. While some were turned off by the way The Force Awakens followed the blueprint of A New Hope, choosing to win the audience back with the familiarity of a winning formula, I fell deeply in love with that film when it was released a year ago and absolutely none of that magic has tapered off. Sure, all of those callbacks to the original films and hearing John Williams return to put some new twists on an established and brilliant musical score put a smile on my face and even the occasional tear in my eye, but the deeper reason why The Force Awakens worked wonders for me was on a character level. Both old and new, the characters across the board felt special and formed a uniquely fascinating bond quickly. Daisy Ridley, John Boyega, Oscar Isaac, Adam Driver, Carrie Fisher, and Harrison Ford, all working together along with supporting players and a terrific script to bring what always made Star Wars great to a new generation. When Disney laid out their plans to not only create new installments of the episodic series of films but also standalone features based on side stories previously referenced, I was excited because frankly, life is too short to complain about too much Star Wars, but I also had a question lingering in my head that cast just a bit of doubt over the success of their plan: would it work without the characters that mean so much to people? This especially applied to the first of these films, released this weekend titled Rogue One, because two years from now we will be watching the origin story of Han Solo and going forward after that I have heard other concepts rumored involving established characters. Rogue One, directed by Gareth Edwards who made the wonderful Monsters with limited resources and a terrific piece of blockbuster filmmaking with the new Godzilla, focuses on the rebel team that steal the plans for the Death Star that reveal the weakness utilized in A New Hope to destroy it, and thus beyond a few cameos and the return of a familiar, iconic villain, this is a Star Wars film that would rely almost entirely on a new cast and one that we would only know for a single movie. That last part, the fact that it was a one-off that was certain to not receive the sequel treatment given that its sequel is, well, A New Hope, presented the most difficulty in making Rogue One work and sure enough that factor played a role in the biggest and for me only real flaw in the film. Trying to establish a team of characters that work together for such an important mission in only two hours, with the final (and amazing) battle sequence taking up 45 minutes of screen time made it pretty much impossible to develop these characters and provide the necessary depth to make their relationships blossom on screen. I have come across a fair amount of people complaining that the first hour plus of the film is "boring" when I didn't find that to be the case at all. 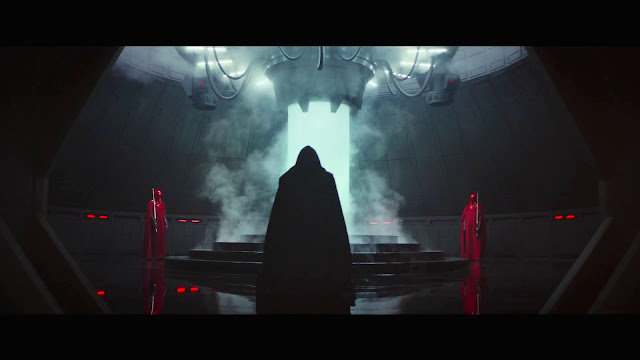 If anything what Rogue One needs is more of this, 20-30 minutes more of character depth and relationship explaining/building because then, when the battle is raging and the bodies are falling to the ground in agony, the emotional impact of what we are seeing would be so much stronger. I decided to sleep on Rogue One rather than start writing immediately when I got home last night, mostly because of what I addressed at the start of this review; my inability to properly critique films from a franchise that means so much to me. I am glad I did, not because I could sort out a growing pile of issues I had with it but rather so I could let everything that worked so wonderfully seep into my consciousness and dance around in there, like the incredible photography of Greig Fraser that created instantly indelible imagery that will prove to be unforgettable, like Vader's castle on Mustafar or his scene at the end of the film that is sublime, or the vast scope of the Death Star on screen that demonstrated the sheer daunting scale of such a weapon in a way we have never seen before. The fact that we get to visit new worlds and expand on this universe I love so much, with even just a brief visit to a planet called Eadu creating such an essential and gorgeous sequence taking place in the darkness during a driving rain. 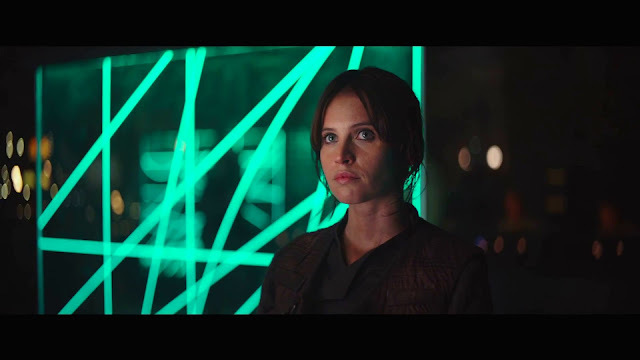 The performances, even if they weren't allowed to flourish properly, are still all on point, from Felicity Jones as the strong Jyn Erso, daughter of Galen Erso (Mads Mikkelsen), the man personally put in charge of constructing the Death Star, Diego Luna as Cassian, Donnie Yen as Chirrut, Forest Whitaker as Saw Gerrera, Riz Ahmed as Bodhi and the supremely talented Ben Mendelsohn as Imperial Officer Orson Krennic. Also, Alan Tudyk shines as the newest droid to steal scenes in the universe, K-2SO. The cast is outstanding, and if given more time to breathe I truly think they would have proved to be a special new piece of the Star Wars universe. A solid musical score from composer Michael Giacchino that may not feature any one piece quite as brilliant as "Rey's Theme" that Williams introduced in The Force Awakens, but his arrangements balance the old and new well and the notes that haunt over various moments involving the Empire during the earlier portions of the movie stood out to me. 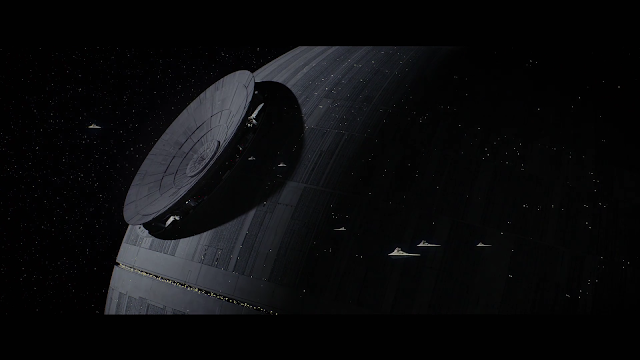 Rogue One is a thrilling film, terrific entertainment that is worth the price to go with family or friends and enjoy a spectacle on the big screen. Your kids may not ask you to rush out and buy the toys from this one at the same level as I'm sure they did with The Force Awakens (lord knows my kid wanted them all), but I would imagine Jyn will be a popular character for a lot of young girls out there that should feel proud that Disney has now gone back to back with Star Wars films featuring a female lead that demonstrates her power and bravery without needing to be saved by a knight in shining armor. Now if only they could go ahead and hire one of the many incredible female directors out there for a project, rather than give the massive gig of Episode IX to someone like Colin Trevorrow, but I digress. The point is, what does work during Rogue One outweighs what doesn't spectacularly, likely leaving most people in the audience walking out of the theater not picking apart the flaws but rather glowing in the adventure and action set pieces that are big, bold and beautiful. I'm going to take my daughter to see it this weekend and I can't wait to experience it again. I can't stop smiling, even just writing this review as I play my favorite moments back in my head over and over. That's what Star Wars does to me. I can't help it. Better than Force Awakens. I loved all the nods to the larger story while still being able to tell its own self contained story. Being a fan of the Star Wars comics and books, there is a lot more story to tell in this universe beyond the Skywalker clan's. this is proof that they can tell stories long after Episode IX is over. Saw it for the second time last night. Love it, but I can't agree with you on being better than TFA. There is just something magical achieved in TFA with the characters, old and new, that I never quite feel in Rogue One. I still wish this was maybe 20 or so minutes longer, specifically added onto the first half to build the people and the relationships. It's a minor quip because I still love the film, but it's what elevates TFA over it for me. I do completely agree though, there are plenty of stories that can be told and I am excited for all of them.